Tower District Real Estate Historic homes, eclectic shops & restaurants, lots of vintage charm. Looking for vintage charm, vibrant nightlife and quaint local eateries? Meet Fresno’s historic Tower District. 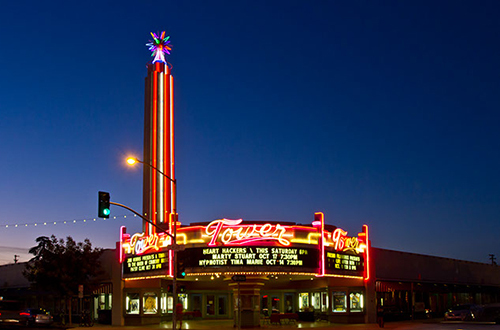 One of the oldest neighborhoods in Fresno, the Tower District was built in the 1930’s as a suburb, just north of downtown. The centerpiece of the neighborhood is the neon-bright Tower Theatre. This 761-seat Art-Deco era theatre originally opened in 1939 as a 20th Century Fox Movie House. Today it is a fully restored performing arts center and beloved historic landmark, one of California’s finest examples of 1940’s era moderne deco style. Within walking distance of the theatre, you can find an eclectic mix of shops, restaurants, coffee shops and homes. Homes in this area are known for a variety of historical styles and unique sense of charm. If you’re looking for a home that’s far from “cookie-cutter,” Tower may be the neighborhood for you. Here you’ll find Craftsman-style bungalows, European-style Tudors, traditional Victorians, Mediterranean revivals and more. The Tower District’s sidewalks are lined with dozens of restaurants, bars, theaters, record stores, art galleries, vintage clothing shops and cafes that draw an eclectic mix of locals and visitors, especially after dark. The majority of these businesses surround The Tower Theatre on Olive Avenue. Are you a fan of live theater? We’d definitely recommend booking a table at Roger Rocka’s Dinner Theater or a performance by Good Company Players at 2nd Space Theater. Right down the street, Sequoia Brewing Company, known for their award-winning ales, great food and outdoor patio, is a great place to hang out at before or after the show. Some other restaurants we’d recommend are Casa de Tamales for premium handmade tamales, Piemonte’s Italian Deli for a Tower landmark with delicious deli sandwiches, Me-N-Ed’s Pizza for many Fresnans’ favorite local pizza, Quesadilla Gorilla for gourmet quesadillas, Oggi Cosi Si Mangia for Italian food in an elegant dining atmosphere or Veni Vidi Vici for a casual neighborhood spot with seasonal, local food. Other local specialty foodie spots and coffee shops to explore include Ampersand Ice Cream, Kuppa Joy Coffee House, Teazer World Tea Market and Frosted Cakery. A short drive down Olive Avenue will take you to one of the Central Valley’s most popular attractions, Fresno Chaffee Zoo. This is a must-see spot for those visiting Fresno. While you’re there, make sure to check out the new African Adventure exhibit and grab a bite to eat at the Kobje Lodge. Want to learn more about The Tower District? If you’re looking to explore The Tower District real estate market, or the greater Clovis or Fresno area, our team of local experts at Raymer Realty Group would be more than happy to answer your questions, guide you around the area and maybe even help you find the perfect home. Contact one of our agents today!